The crossroads Asia project (2011-2016) has ended. Six years after its creation, the Crossroads Asia competence network is coming to an end in December 2016. During the project, Crossroads Asia members have engaged in local and global conversations on the future of Area Studies in an increasingly interdependent world. The network has produced a wealth of studies that have challenged ‘fixed’ ways of conceiving of space, areas, and regions, questioned hegemonies and used novel methods to interpret the social world. The final conference, “Area Studies’ Futures“ in September 2016, provided an excellent venue for an international group of scholars to present project results, exchange ideas and discuss how to conduct Area Studies in the 21st century. The Crossroads Asia members would like to thank ist donor, the BMBF, for its continuous support and in particular the highly professional DLR team. We also wish to thank the extended network for their interest and collaboration, the Center for Development Research (ZEF) in Bonn for hosting the Coordination Office, as well as current and former staff members for their dedication. We wish everyone all the best for the future! 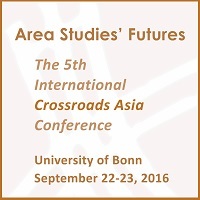 Crossroads Asia will continue to exist online by means of Facebook, Academia.edu, Ell-pses.net and the following email address: crossroads.coordination(at)gmail.com. How do globalisation, digitalisation, urbanisation and migration challenge concepts of ‘areas’? How does space intersect with a sense of belonging, and how do spatial constellations shift through time? How can Area Studies account for the Anthropocene? What can contribute to overcoming epistemic hegemonies, ethnocentrism and "othering"? Find the full program in our conference flyer or on our conference page. There is also a conference report with summaries of the individual panels. Themes such as the ‘quiet’ production of spaces, points of divergence and confluence, in-betweenness and blind spots have all underpinned efforts within the Crossroads Asia network to reposition Area Studies for the 21st century. All of these topics have one element in common: as subjects they are elusive, intangible and/or uncategorizable. Building on this thread, the Crossroads Asia network is happy to announce the launch of its new blog, entitled ell-pses.net. "The Power of Areas" by Catherine Reynolds (article review).